Harumi was very patient and kind. It was my first try with koto and I hope I could come back again to learn more! 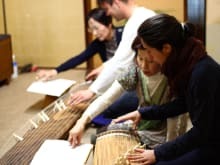 Taking a private koto lesson was the most memorable experience of my whole Japanese vacation. The lesson is in a traditional Japanese house in a neighborhood near Nijo Castle. Harumi was very welcoming and encouraging. Although the lesson lasted only a few hours, I learned a lot. I enjoyed playing koto with Harumi. The highlight was her playing a song at the end of the lesson. I would highly recommend this experience to anyone who wants to immerse themselves into Japanese culture.